Two small boys, a husband and a renovation project: Plaster Master, or Plaster Disaster? Plaster Master, or Plaster Disaster? 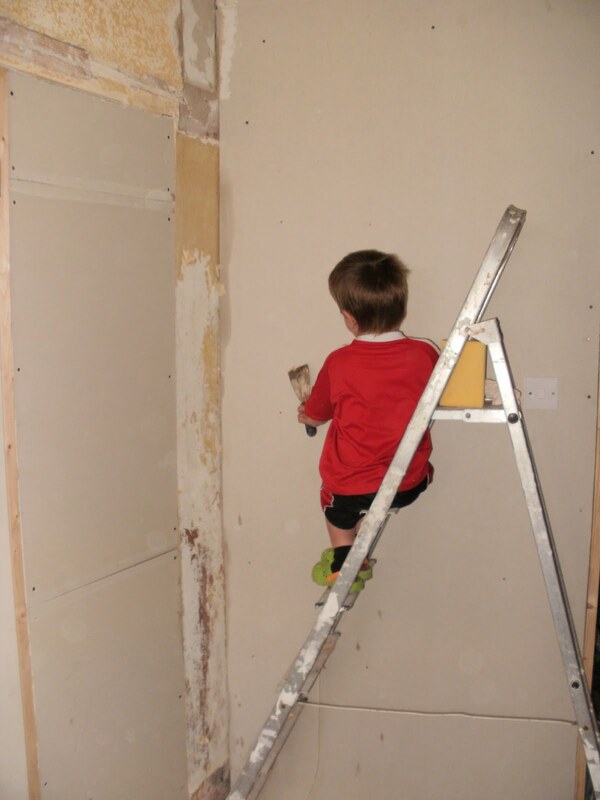 We first attempted plastering in the kitchen, what seems many, many weeks ago now. It was on a wall mainly covered in kitchen units so it seemed like a good place to start. We were reasonably proud of our efforts – until the builders did a spot of plastering with a finish like glass (very stroke-able!). Having now knocked out the chimney and dry-lined the external wall, we decided to crack on with plastering in the master bedroom. We did one wall and then watched a youtube film of ‘how to plaster’ when it became apparent that our wall has the texture of rough sandpaper. Diagnosis: too much water, we rinsed away the fines. So the next wall we took on was the one with the door, so I took the left hand side and PM took the right. It became the plastering equivalent of pistols at dawn. Plasterers ready? Floats ready? Go! There’s a lot of swearing as we plaster as trowels gain a mind of their own and plaster peels off the wall at the slightest touch. Eventually we both finished our designated areas. My side is the best (but I’m biased!). I think we then became too smug and cocky as the following nights attempt was pretty dire – lumps, patches and lots of swearing. Tonight, my designated area is the inside of the living room cupboard and PM is doing the patch to the left of the wardrobe. As I have the inside of a cupboard, I’m pretty sure it will probably be the best plastering I ever do! The theory is that by the time we have done all the private rooms, our plastering will be of an acceptable quality to do public areas such as the hall and bathroom. If not, there’s always wallpaper! All hands on deck to help with the prep!